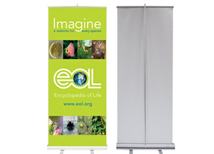 Our economy retractable banner stands are a great option for exhibitors who need a portable graphic display that is affordable. 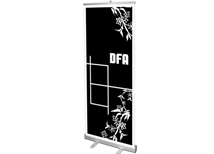 We also have standard and premium lines of retractable banner stands that are designed for long term use. All graphics are printed on a high quality 13 oz. vinyl material that is curl resistant. 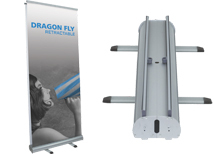 If retractable banner stands are not right for you please look at our complete banner stand selection to find the correct one. Banner stands are the most affordable and portable trade show displays available. 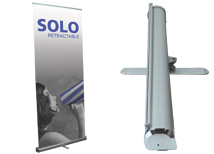 The retractable banners are even easier to assemble then standard ridged pole banners. The economy line of pull up banners are ideal for companies that need an effective graphic display for a short period of use. The hardware of the banners have a 90 day warranty and is a very good value for the money. The graphic material is a high quality vinyl that is rated for indoor and outdoor use. Many other economy banner stands use very low quality vinyl that breaks down and curls excessively. These banner stands only use a high grade vinyl that will actually hold up over time.